It's been nearly a year since Leopard, the 5th incarnation of OS X, was announced. If you can't recall all the public features, here's a refresher you can glance through before the big show on Monday. The secret features revealed there should be substantial, considering the OS's long delay to October. Leopard's most radical concept is Time Machine, a way to back up your computer without actually going to the hassle of backing up your computer. The system journals every change on your disk, giving you access to older versions of your work. Want a file you just overwrote or deleted? Use Time Machine's browser to scroll back a few days, then pluck your data from oblivion. Of course, if your drive goes poo-poo, your Time Machine is useless. We're impressed, but we'd be more impressed if Time Machine could go forward in time to when our blog posts are already written, 10 hours from now. Time Machine can backup, on the fly, to an external or network'd drive. Here's the official Apple video. I personally use Mail, and I'm super excited over two tweaks that'll appeal to organizing freaks. The first is the Notes box. How often do you send yourself an emails as reminder notes? The new Mail has a dedicated box that formats Notes messages so they look like Post Its. The Other function is the ToDo list. Mail lets you highlight text in any app—even document files in Finder7mdash;and turn them into things on your ToDo list. Sweeeeeeet. Mail also does stationary now, in HTML. Just like Outlook Express did 5 years ago. The templates included range from photo album to ecards. They're nice. Here's a video. It's fargin awesome. We're talking app screen-sharing over iChat video (so you can show off slideshows, or powerpoint, or even videos in Quicktime.) Then, there's iChat's backdrops. The backdrops can overwrite your messy room with a photo of a beach, or of Times Square. The coolest thing? iChat supports video backdrops—one example they had was of someone appearing to be riding a rollercoaster. Then, there's Screen Sharing, which I didn't hear Steve talk about during the keynote. I assume it's a VNC type of remote control. Apple's video here. All the new Macs support high res LCDs. But even the biggest LCDs get crowded after you open a spreadsheet, a mail program, and a browser. So that's where Spaces comes in. Spaces lays your application windows out across 4 virtual desktops that you can quickly switch between. You can zoom out to see all 4, then drag apps between each virtual desktop. BTW, this has been around for a long time in Linux machines. Gotta love how Apple accuses M$ft of copying, while they've copied third party apps like Konfabulator since Tiger. 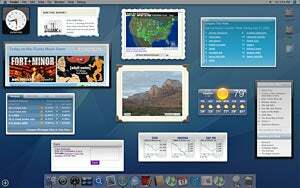 Dashboard, if you don't know, is a program that runs useful mini apps called Widgets: They can check the weather, check stock prices, rock some basic calculator action, and loads more. (Here's Apple's directory of Widgets.) What's new? A Widget creator that seems more suited for developers, and a way to turn any part of a webpage into a Widget. Eh. Spotlight is OS X's search service that can find not only files, but images from iPhoto, email from Mail, and contacts from Address Book. You get the idea — you can search your system for whatever. What's new here is support for searching Mac's across the network, and support for additional search syntaxes. Meh. Parents can limit internet access on machines by remote control. It wasn't announced at the Keynote, but Giz found this sidebar on the Leopard website. Bootcamp, the software that helps Windows Machines run on Macintel machines, comes out of beta and will ship with Leopard. So will Front Row, Apple's media browser, and Photo booth. Core Animation is a developer tool for scripting graphics. It's best explained by watching an example of a program. Leopard is Apple's new operating system, due to hit the shelves in the spring of 2007. The OS has been written to fully support 64-bit apps and the Quad Xeon 64-bit chips in the new Mac Pro desktops. And at the same time run older 32-bit apps. All without emulation.